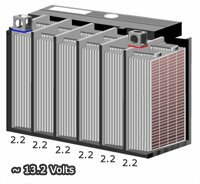 All Lead acid batteries (Gel, AGM, Flooded, Drycell, etc) are made up of a series of 2.2 volt cells that are bridged together in series to reach their final desired voltage. For instance, a 6 volt battery will have 3 cells (3 x2.2= 6.6 volts), a 12 volt battery will have 6 cells (6 x2.2=13.2 volts) and so on.That 2.2 volts is the fully charged, straight off the charger number. 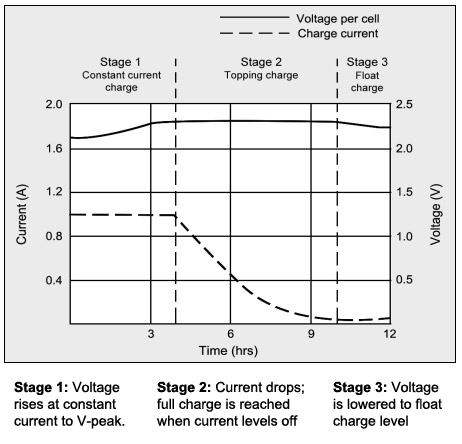 The actual resting voltage, or the voltage a battery will settle at 12-24 hours after being removed from the charger, is closer to 2.1 volts per cell, or about 6.4 volts for a 6v battery, and 12.7 volts for a 12v battery. These numbers assume 100% healthy cells, and may vary a bit lower for older batteries. Do You Need Find Replacement Parts for Your Streamlight Vulcan or Fire Vulcan Lantern? 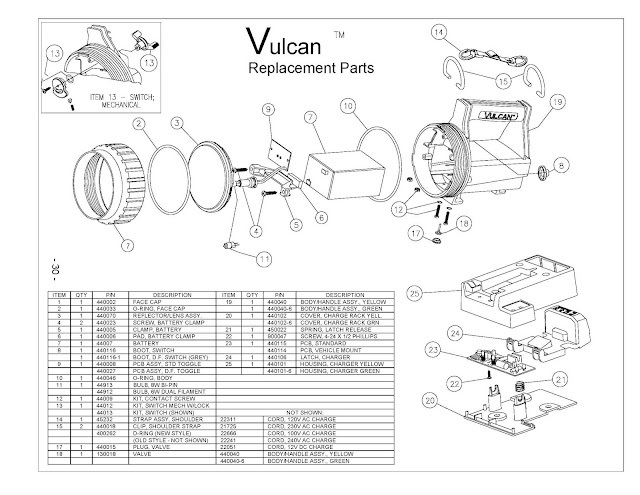 Here is our link to the Streamlight Vulcan Parts Diagram. Need to Replace A Broken Lens On Your LiteBox Lantern or Vulcan Lantern. This replacement part is the "Spot light" reflector lens tha tfits the Streamlight LiteBox, Vulcan or Fire Vulcan laterns. IT is the lens only. Typical replacement when the plastic lens gets broken. Here's what the Minitor VI Motorola Original replacement battery looks like. Here is a video showing the packaging for PC-AAA Duracell Procell PC2400 alkaline batteries. It helps with knowing minimum order quantities and how many batteries per carton and case. Thanks for watching, hope it answered your questions on quantities to order for Duracell Procell PC2400. The date code for Motorola original two way radio batteries is found on the label as shown in our YouTube video. Usually you will see the battery part number on the left above the product bar code. To the right side of the product number is the date code. in the example below date code reads 1325. 13= year 2013 and 25= the 25th week of that year. The rechargeable Li-ion battery does not like prolonged storage. Irreversible capacity loss occurs after 6 to 12 months, especially if the battery is stored at full charge and at warm temperatures. It is often necessary to keep a battery fully charged as in the case of emergency response, public safety and defense. Running a laptop (or other portable device) continuously on an external power source with the battery engaged will have the same effect. The combination of a full charge condition and high temperature cannot always be avoided. Such is the case when keeping a spare battery in the car for a mobile phone.